How many of you know the fact that your daily e-mails are passaged through a deep espionage filter? This was unknown until the whistleblower Edward Snowden broke all the surveillance secrets, which made privacy and security important for all Internet users than ever before. 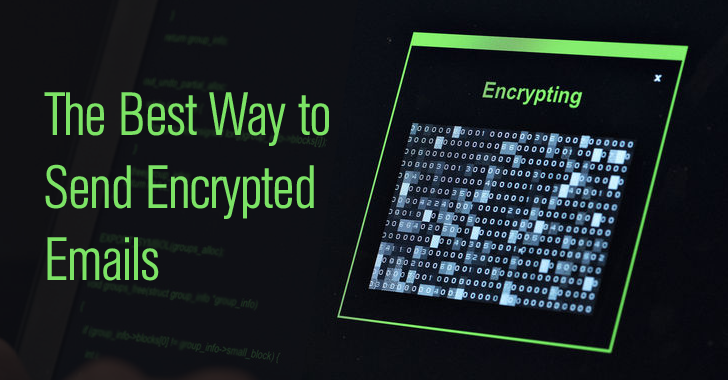 I often get asked "How to send encrypted email? ", "How can I protect my emails from prying eyes?" and "Which is the best encrypted email service?". Although, there are a number of encryption tools that offers encrypted email service to ensure that no one can see what you are sending to someone else. One such tool to send encrypted emails is PGP (Pretty Good Privacy), an encryption tool designed to protect users’ emails from snooping. However, setting up a PGP Environment for non-tech users is quite a difficult task, so more than 97% of the Internet users, including government officials, are still communicating via unencrypted email services i.e. Gmail, Yahoo, and other. But here is good news for all those non-techies, but privacy-conscious Internet users, who wish to use encrypted e-mail communication without any hassle. ProtonMail has been invite-only since 2014, but now the email service has made itself available to everyone and launched new mobile apps. To increase storage capacity, you can purchase ProtonMail's paid accounts. NOTE – Always remember your password to decrypt the email inbox. Once forgot, you would no longer retrieve your encrypted emails. Even if someone intercepts your communication, he/she can not read your conversations because all emails you send or receive with other ProtonMail users are automatically encrypted end-to-end by the service. Once done, your encrypted email recipient will get a link to the message with a prompt to enter his/her same password in order to read it. 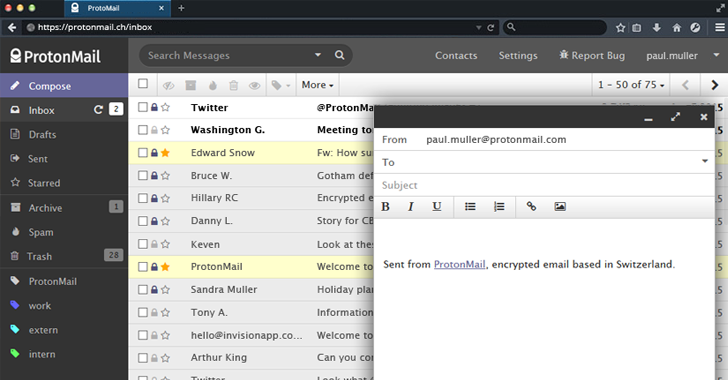 Another friendly feature that ProtonMail offers is Self-destructing emails. All you need to do is set an expiration date for an encrypted email you send, and it will get self-deleted from the recipient’s inbox once the date arrives. Why ProtonMail won't have to comply with American Laws? In a previous article, I explained that ProtonMail is based in Switzerland, so it won't have to comply with American courts’ demands to provide users data. In worst case, if a Swiss court ordered ProtonMail to provide data, they will get only the heaps of encrypted data as the company doesn’t store the encryption keys. 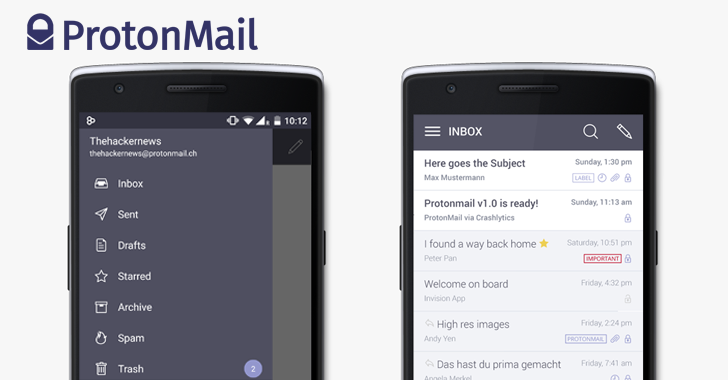 ProtonMail has gained an enormous amount of popularity during its developing stages. ProtonMail encrypts the data on the browser before it communicates with the server, therefore only encrypted data is stored in the email service servers, making it significantly more secure for those looking for an extra layer of privacy. Feel free to email our team at thehackernews@protonmail.com.